Private Tours of Pompeii, Herculaneum, Mt. 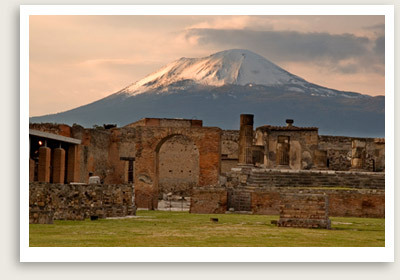 Vesuvius Include: Entrance tickets to Pompeii & Herculaneum, private tour guide, transportation, , taxes, toll, parking. Departure Points: Naples, Amalfi, Positano, Sorrento. Note: Not recommended for travelers who are not in good physical condition. Embark on one of the most incredible day tours in Italy one can do- Mt. Vesuvius, Pompeii and Herculaneum tour. Your private tour will take you to the only active volcano in mainland Europe, Mt. Vesuvius. Your tour guide will pick you up at your hotel and drive you to Mt. Vesuvius. Upon arrival, the site’s tour guide will conduct the Mt. Vesuvius tour. Your licensed expert tour guide for the day will also conduct a private Pompeii tour. Thirty feet of hot mud and volcanic ash buried this Roman city completely when Mt. Vesuvius erupted in 79 A.D. You will have a detailed private walking tour of this once-prosperous trading center, established in 12th century B.C. With your private guide to this magnificent Roman town, you will explore its streets and squares, public buildings (temples, spas, theaters and the amphitheater), storefronts, houses, pizza parlors, and other artifacts from Pompeii’s heyday. After your guided Pompeii tour, you will have a stroll in Herculaneum, also destroyed by Mt. Vesuvius in 79 A.D. This magnificent Roman town was a holiday resort for the Roman rich. You will admire its wonderful houses with impressive frescoes and mosaics. While Herculaneum is smaller than Pompeii, its buildings are much better preserved.